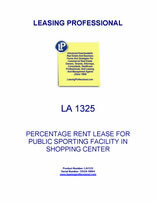 This lease is designed for a public sporting (such as a hockey, bowling or ice skating) operation that takes space in a regional shopping center. The tenant is obligated to pay percentage rent like other shopping center tenants, and to observe typical shopping center covenants such as opening covenants, continuous operation, participation in promotional fund program, and the like. This Lease is made as of _________________, by and between COMMERCIAL PROPERTY LANDLORD, INC., a __________________ corporation ("Landlord"), and SPORTING FACILITY TENANT, INC., a _________________ corporation ("Tenant"). Certain Fundamental Lease Provisions presented in this Section represent the agreement of the parties, subject to further definition and elaboration in the referenced Sections and elsewhere in this Lease. In the event of any conflict between any Fundamental Lease Provision and the balance of this Lease, the latter shall control. (d) Approximate Floor Area of Premises: _________ square feet; approximate frontage: _______feet; approximate depth: ________feet. (e) Initial Minimum Annual Rental: $_________ per year payable at $_______ per month. (h) Use: The operation of a public sporting center primarily used for the sport of ________________ and all ancillary businesses normal to the industry including but not limited to a restaurant, bar or lounge serving alcoholic beverages, equipment rental shop, nursery, arcade game room, and incidental vending machines. EXHIBIT A – Description of property ("Shopping Center"). EXHIBIT B - Plan showing the location of the premises and common area. EXHIBIT C - Description of any work to be performed by Landlord, if any, and by Tenant in or on the premises. EXHIBIT D - Sign Criteria. EXHIBIT E - Tenant's Certificate. EXHIBIT F - Rules and Regulations. Landlord, in consideration of the obligations to be performed by Tenant, leases to Tenant and Tenant leases from Landlord, on the terms and conditions set forth, the commercial space referred to as the "premises," shown hatched on Exhibit a (excluding conduits and facilities as may be located in the premises for the common use of Landlord and other tenants). Tenant accepts the premises in an "as is" condition' except for the specific work to be performed by. Landlord, if any, described as set forth in the description of "Landlord's Work" in Exhibit C. Tenant at its sole cost and expense shall be responsible for the completion of the work described as "Tenant's Work" in Exhibit C; all of which shall be performed in accordance with and be subject to Section 11. 4.1 Definition of Term. The term of this Lease shall be for the number of "lease years" (defined in Section 4.5) specified in Section 1(b), plus any partial calendar month during which the term commences if the term does not commence on the first day of a calendar month. 4.2 Commencement Date. The term of this Lease shall commence ("Commencement Date") on ____________. Tenant has entered into the premises prior to execution of the Lease on an Early Entry License Agreement. For the purposes of this Lease, the commencement date shall be ____________. The term "delivery date" means the date on which Landlord gives Tenant written notice of the substantial completion of "Landlord's Work" and Landlord tenders possession of the premises to Tenant. The term "substantial completion" means that Landlord's Work is complete to the point that Tenant's contractor may commence Tenant's Work, it being understood and agreed that Landlord will not install or complete all items of Landlord's Work until Tenant has commenced and completed portions of Tenant's Work to the point Landlord may re-enter the premises and complete Landlord's Work. Tenant shall promptly commence and diligently complete the construction of Tenant's Work upon delivery of possession of the premises by Landlord and shall exercise its best effort to open for business in the premises within thirty (30) days of the Commencement Date. From the delivery date until the Commencement Date Tenant shall perform and be bound by all of the provisions of this Lease except those requiring the payment of rent and other charges. 4.3 Tenant's Certificate. Following the Commencement Date, Tenant shall execute, acknowledge and deliver to Landlord a Tenant's Certificate in the form of Exhibit E, within ten (10) days of receipt of such Certificate from Landlord setting forth, among other things, the Commencement Date and the termination date of this Lease and such other provisions as may be required by Landlord's lender or any prospective purchaser. Tenant's failure to execute and deliver such Certificate shall not affect Landlord's determination of the Commencement Date in accordance with the provisions of this Lease and shall constitute an acknowledgement by Tenant that the statements set forth in the Certificate are true and correct without exception. 4.4 Failure to Deliver. If the delivery date does not occur within two (2) years of the date of this Lease this Lease shall automatically terminate and cease to be of any force and effect. Landlord shall have no liability or obligation to Tenant by reason of such termination except Landlord shall return to Tenant any advance rent and security deposit paid by Tenant. 4.5 Lease Year. A "lease year" is a period of twelve (12) consecutive calendar months commencing on the first day of the first calendar month of the term of this Lease, except the first lease year shall also include any partial month during which the Commencement Date occurs if the Commencement Date does not occur on the first day of a month, and the last lease year shall end on the expiration or sooner termination of this Lease. 5.1 Minimum Annual Rental. Tenant shall pay as rental for the use and occupancy of the premise the minimum annual rental as set forth specified in Section 1(e), payable in advance, in twelve (12) equal monthly installments during each lease year, on the first day of each month without offset or deduction, except the first payment shall be made upon execution of this Lease. Should the Commencement Date be on a day other than the first day of a month, the rental for such fractional month shall be computed on a daily basis for the period from the Commencement Date to the end of such month, at an amount equal to one three-hundred-sixtieth (1/360) of the minimum annual rental for each day in such fractional month and shall be paid on the Commencement Date. 5.2. (a) Additional Rental Payment Owing Upon Tenant's receipt of Nondisturbance Agreement. Tenant shall pay to Landlord additional rent in the amount of $____________(hereinafter referred to as "additional rental payment"), according to the payment schedule noted below, upon receipt of a nondisturbance agreement (the "Nondisturbance Agreement") from Landlord's current lien holder of record, _______________ ("Lender"), or from the assignee of Lender with respect to such lien, hereinafter referred to as "Landlord's lender". The Nondisturbance Agreement shall be in a form acceptable to Lender. The Commencement Date of the first monthly payment shall be the later of (a) ____________, or (b) the first day of the first month following the month during which Landlord has provided to Tenant the Nondisturbance Agreement. Landlord shall apply all amounts received from Tenant pursuant to this Lease first to the obligations of Tenant other than the additional rental payment, and lastly to the obligation of the Tenant for the additional rental payment. The failure by Tenant to make any installment of the additional rental payment when due shall cause the entire unpaid remaining balance of such additional rental payment to become immediately due and payable to Landlord. The failure by Tenant to make any installment of the additional rental payment when due shall constitute a material default by the Tenant of the terms of the Lease under paragraph 20.1, and the Landlord shall be entitled to any and all remedies provided under the terms of the Lease as a result of such material default, as provided under paragraph 20.2 of the Lease. The obligation of tenant to pay the additional rental payment is expressly conditioned upon Tenant's receipt from the Landlord's lender of the Nondisturbance Agreement. (b) Letter of Credit. As collateral for the fulfillment of the Tenant's obligation to make the additional rental payment described herein, Tenant shall provide to Landlord within ten (10) days after the later of (a) ____________, or (b) the date of Tenant's receipt of the Nondisturbance Agreement, a $____________irrevocable direct pay or stand by letter of credit ("Letter of Credit") in favor of Landlord, issued by a bank acceptable to Landlord in its sole and absolute discretion, and confirmed, if Landlord deems such confirmation necessary, by a bank acceptable to Landlord in its sole and absolute discretion, in form and substance acceptable to Landlord. The Letter of Credit shall have as an expiry date for payment, a date no earlier than the Lump-sum Payment Due Date, as defined above; provided, Tenant can choose an earlier expiry date for the Letter of Credit on the condition that prior to expiration of the Letter of Credit, the Tenant replaces the Letter of Credit with a replacement Letter of Credit, or a series thereof, which, when taken as a whole, have an expiry date no earlier than the Lump-sum Payment Due Date. If Tenant desires to replace the Letter of Credit, any replacement Letter of Credit in substitution of the previously expiring Letter of Credit shall, with the exception as to the face amount noted below, be on the same terms as the Letter of Credit, shall be issued by a bank acceptable to Landlord in its sole and absolute discretion, shall be issued on or before the 30th day prior to the expiration of the previously expiring Letter of Credit, with notice to Landlord thereof, and the effectiveness of which shall commence concurrently with the expiration of the previous Letter of Credit. Upon any replacement of the Letter of Credit, Tenant may reduce the face amount of the Letter of Credit from $____________to an amount equal to the then unpaid balance of the additional rental payment, as confirmed to Tenant in writing by Landlord. It is agreed that upon the occurrence of a default in the payment of any installment of the additional rental payment when due, or in the event that Tenant fails to secure a replacement Letter of Credit for the previously expiring Letter of Credit, on or before the 30th day prior to its scheduled expiration, Lender may draw upon the Letter of Credit in accordance with its terms, in whole or in part, without resorting to any other security, and may apply any such draw against, and/or hold the proceeds of such draw as security for, any unpaid portion of the additional rental payment. The failure of Tenant to provide the Letter of Credit as provided for herein shall constitute a material default by the Tenant of the terms of the Lease under paragraph 20.1, and the Landlord shall be entitled to any and all remedies provided under the terms of the Lease as a result of such material default, as provided under paragraph 20.2 of the Lease. Upon payment of the Tenant's obligation to pay the additional rental payment, Landlord shall immediately release the Letter of Credit after the end of each calendar year and at the end of the lease term. Tenant shall pay to Landlord with each semi-annual statement a sum equal to the Percentage Rental Rate times the total monthly gross sales for such six month period less the installment of minimum annual rental paid for such six month period. The Percentage Rental paid shall be adjusted after the end of each calendar year so that the total Percentage Rental paid or payable shall not exceed the Percentage Rental Rate times the total gross sales for the applicable calendar year less the minimum annual rental installments paid during such calendar year. Notwithstanding section 5.4(b), Tenant shall pay percentage rent on a semi-annual basis. The measurement periods shall be July thru December and January through June of each year. Tenant shall report sales thirty days after the end of each period and percentage rent is due August 1st and February 1st of each year. (c) Each monthly and annual statement shall be certified as true and correct by Tenant if Tenant is composed of individuals, or by a responsible officer of Tenant if Tenant is a corporation, or by Tenant's managing partner if Tenant is a partnership. After receipt of each annual statement Landlord shall determine whether Tenant has underpaid or overpaid Percentage Rental for the calendar year. Landlord shall apply any overpayment to the Percentage Rental thereafter becoming due and if there has been an underpayment Tenant shall promptly pay such underpayment to Landlord together with interest thereon at the maximum legal rate from the date the Percentage Rental payment should have been made. Tenant shall record at the time of sale, in the presence of the customer, all receipts from sales or other transactions, whether cash or credit, in a cash register or registers, having a cumulative total and which shall number consecutive purchases. Tenant shall keep complete and accurate books of accounts, records and all cash register receipts with regard to the gross sales, credits, refunds and other pertinent transactions made from or upon the premises (including the gross sales of any subtenant, licensee or concessionaire), all of which shall be kept for a period of four (4) years after the close of each calendar year and shall be available for inspection and audit on the premises by Landlord and its representatives at all reasonable times during regular business hours. Upon request of Landlord, Tenant shall provide Landlord with copies of Tenant's (and of Tenant's subtenants, licensees, or concessionaires) Sales and Use Tax Returns if required to be filed by Tenant in the State or County or City where the Shopping Center is located. The receipt by Landlord of any statement or payment of any Percentage Rental for any period shall not bind Landlord as to the correctness of the statement or payment. Any audit or inspection shall be conducted during normal business hours at the offices of Tenant or at the premises. If it shall be determined that there has been a deficiency in the payment of Percentage Rental, then such deficiency shall be immediately due and payable with interest at the legal maximum rate from the date the Percentage Rental payment should have been made. If Tenant's annual statement for any calendar year understates gross sales by more than two percent (2%), then Tenant shall pay to Landlord all costs and expenses incurred by Landlord in making such audit or inspection and in determining and collecting any underpayment. If Tenant's annual statement understates gross sales by more than six percent (6%), or in the event it is determined in the exercise of Landlord's reasonable judgment that Tenant's statement was understated intentionally, then, in addition to Landlord's other rights, Landlord may terminate this Lease on notice to Tenant. (iv) which Tenant, or any subtenant, licensee or concessionaire, in the normal and customary course of its business, would credit or attribute to its operations at the premises or any part thereof. (xi) sales taxes, so-called luxury taxes, consumer excise taxes, gross receipts taxes and other similar taxes now or hereinafter imposed upon the sale of merchandise or services, but only if collected separately from the selling price of merchandise or services and collected from customers. (xii) Any deposit accepted and retained by Tenant shall be included in gross sales. Each installment or credit sale shall be treated as a sale for the full price in the month during which such sale is made, irrespective of whether or when Tenant receives payment therefor. Gross sales shall include any amount allowed upon any "trade-in," the full retail price of any merchandise delivered or redeemed for trading stamps or coupons and all deposits not refunded to purchasers. No franchise, capital stock tax, tax based on assets or net worth or gross receipts tax, and no income or similar tax based on income or profits shall be deducted from gross sales. Also excluded from the gross sales shall be the revenue of the approved subleased operator. The only sublease is the equipment rental shop. Tenant shall include as gross sales those proceeds received by Tenant as Tenant's share from the video games and vending machines.